I have been lurking here in the background since 2013. 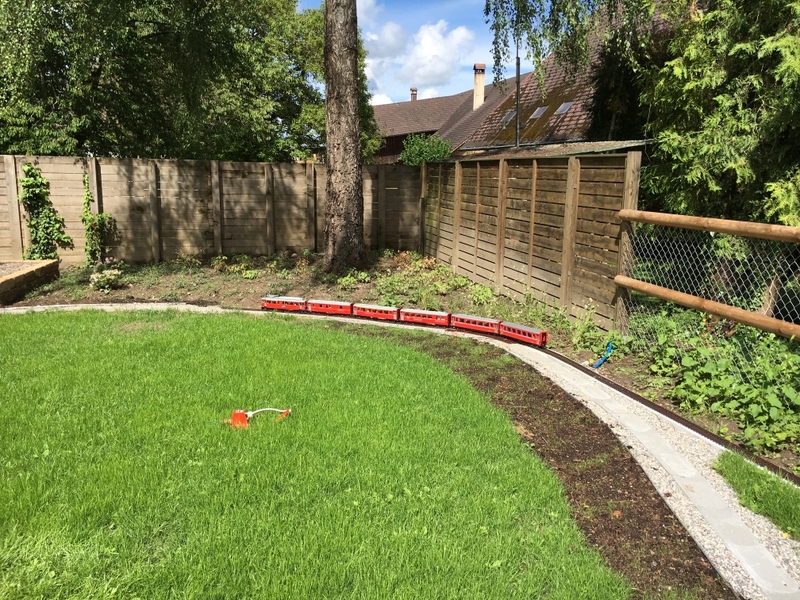 Back then I lived in a flat, I had my trains on a table, and I dreamed about having a garden railway. I read garden railway forums and magazines, joined a G-scale club and visited as many garden railways as I could. In 2016 things started happening. 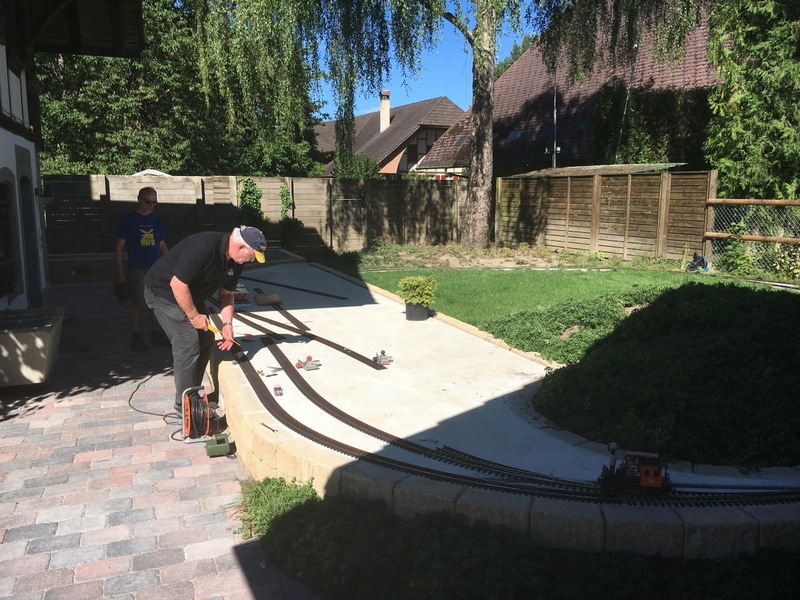 After years of planning, saving and waiting, I was able to start building my garden railway, along with the remodeling of a little old house. My main theme is American Railroads, in particular the Rio Grande Narrow Gauge Railways, in the scale 1: 20,3. But I also really love our local RhB Railways. I just couldn't decide, so I run both. My trains run through Colorado and Graubünden. In this thread I will start at the beginning and document the last two and half years of building the railway, up to the present day. Mooseville? That could be Colorado, and sound like the place where I live. 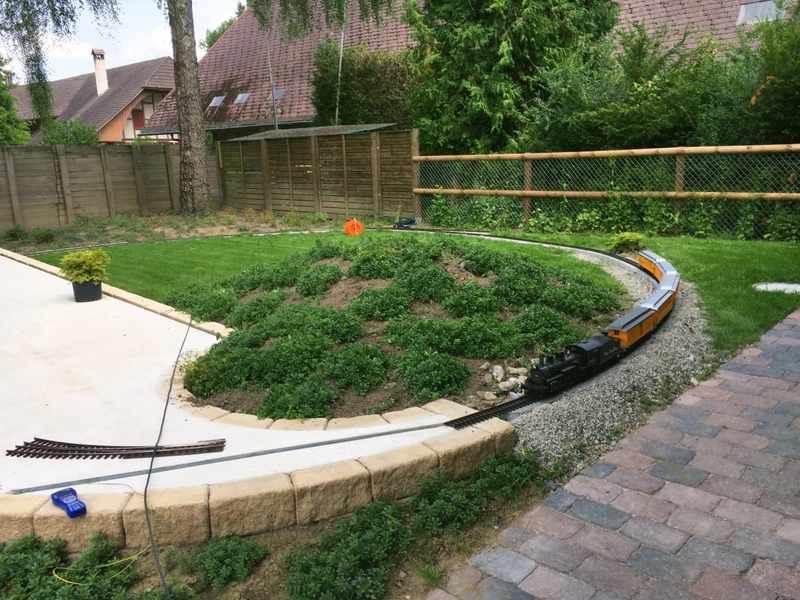 The garden railroad runs round the house in the form of an 8. The dotted line is Phase 2, completed in 2018. In the shed I converted a garage into a storage yard and workshop converted. 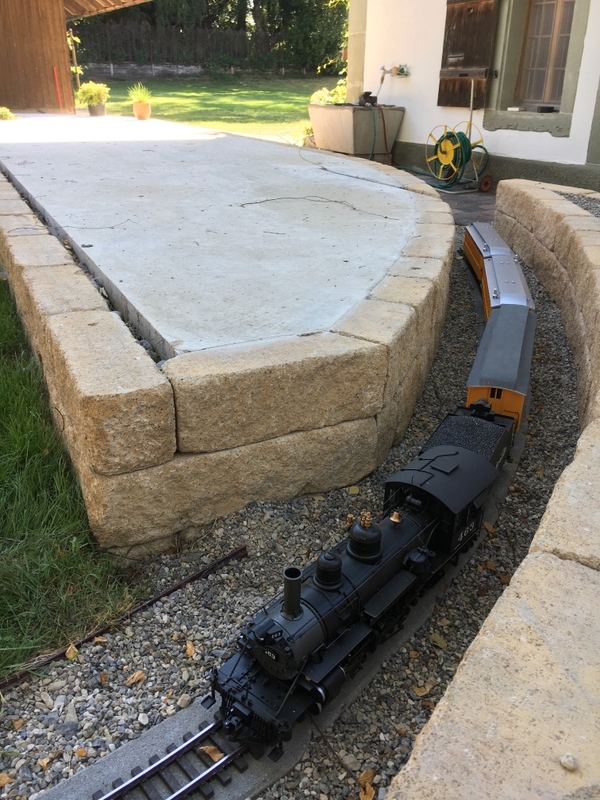 The trains run down a long ramp into the garden. I use LGB and Thiel switches / points with an R5 radius or larger. The maximum gradient is 2%. 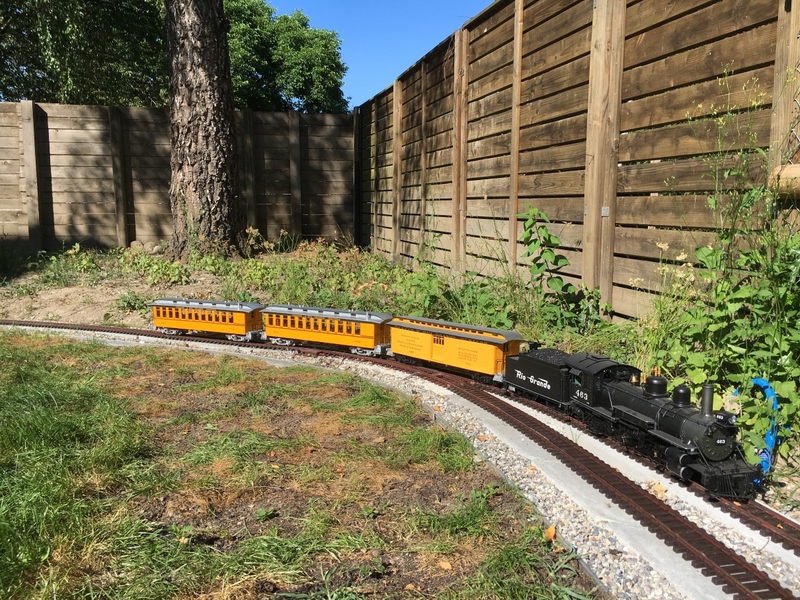 I run track power and DCC, with a Massoth DCC unit and Massoth wireless hand held controllers. 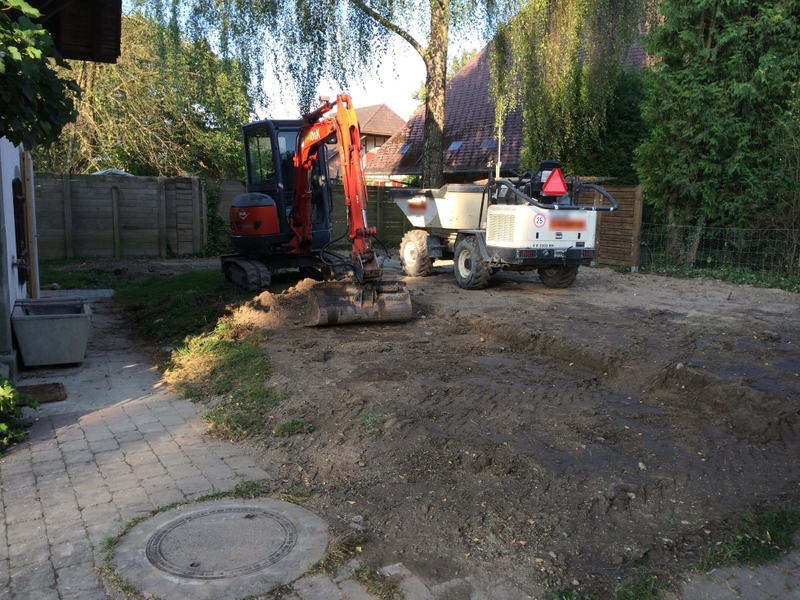 In August 2016 the remodeling of the house started. 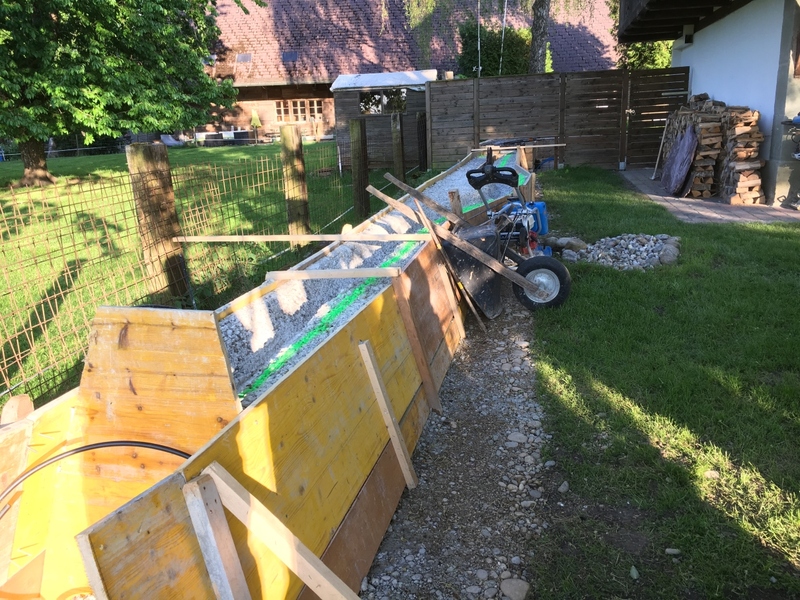 Among other things, a heat pump heater was installed in the shed, making a ditch between the two buildings necessary. 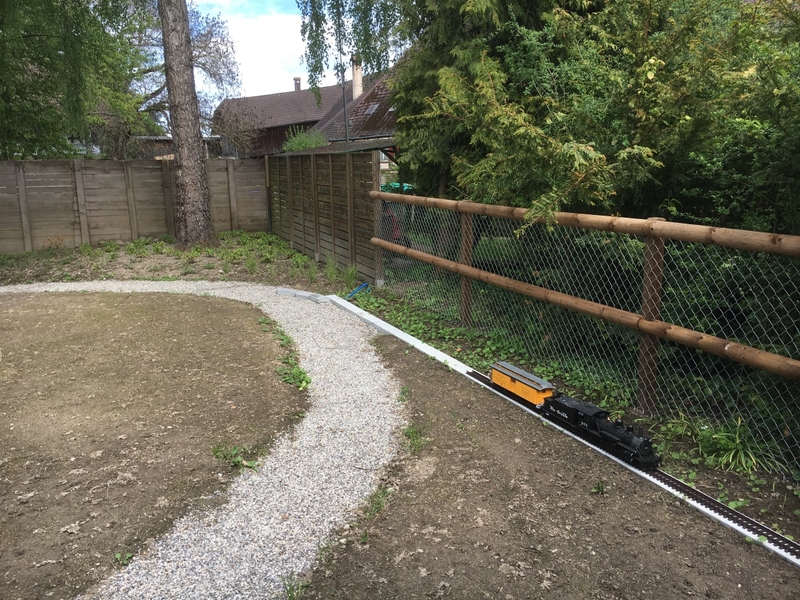 Since construction workers and excavators were already on site, I commission them with some railway construction. 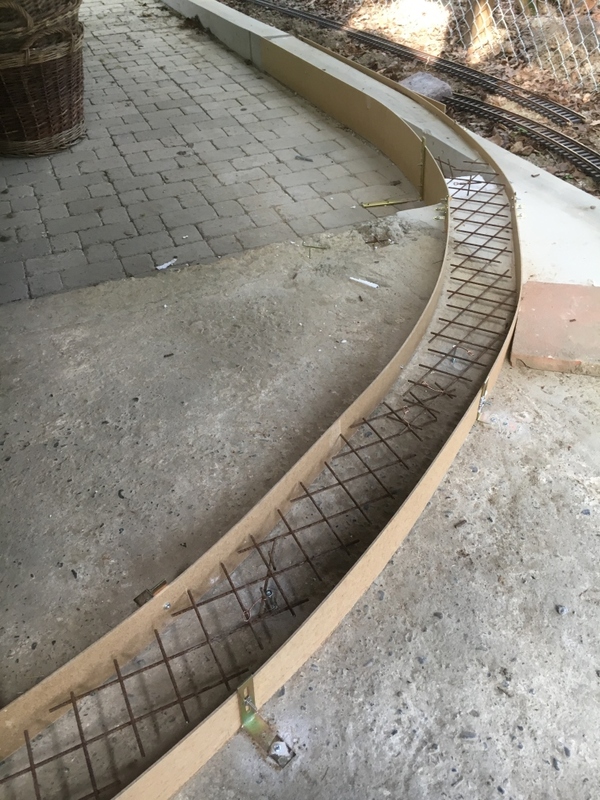 Part of the platform has a concrete surface with very slight incline, to drain off rainwater. This area will be for the street and buildings. 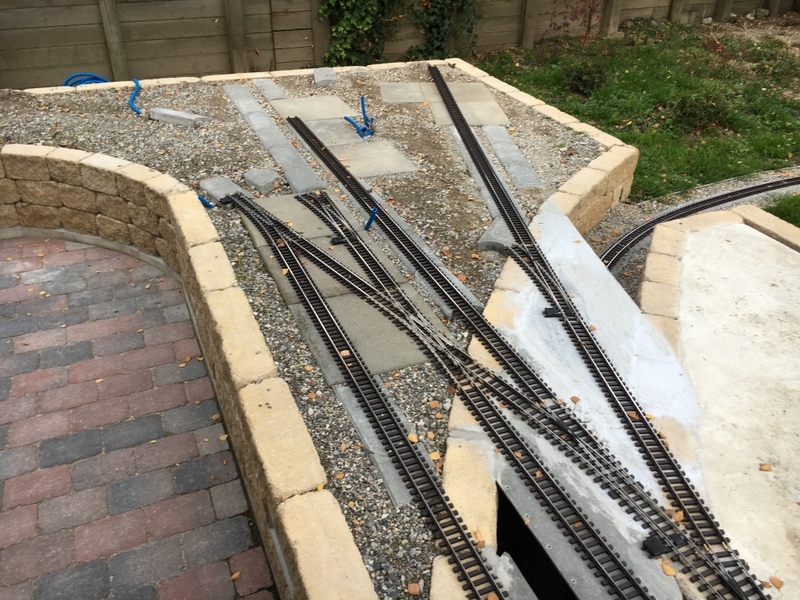 The other part is filled with gravel, where the rail yard is going to be, with a coaling tower and a engine shed . 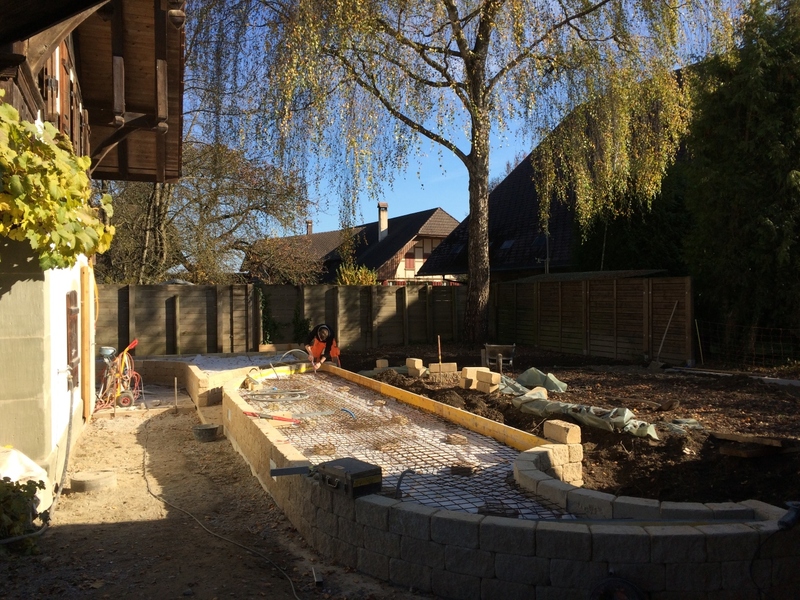 The gravel allows for spontaneous changes. 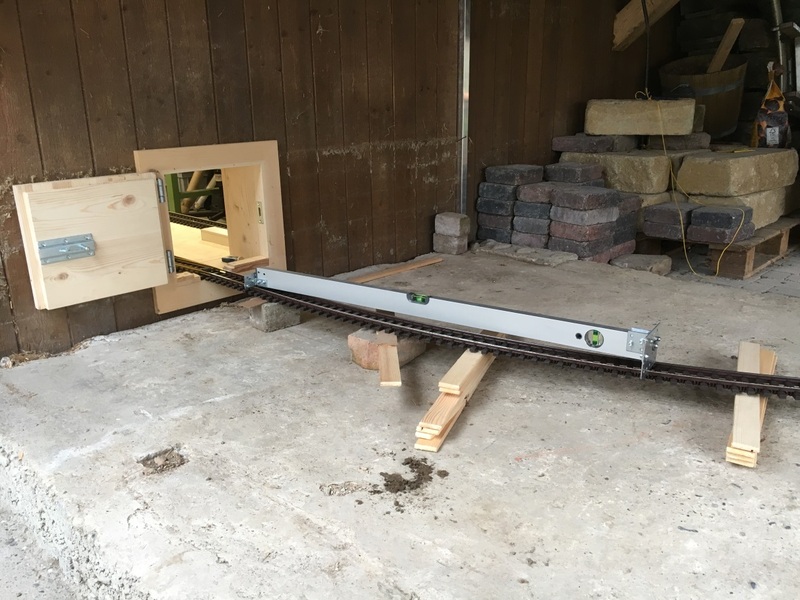 In early 2017, I started work on the storage yard inside the garage, on a purpose built table, about 30 cm off the ground. Any higher, and the gradient down into the garden would be too steep. More in the next installment. Watch this space! You are a patient man and that is one well planned project. Nicely done. I want a garage-block like that ! All I need to do.. Is move the house (and next door + new extension) two-feet to the left. 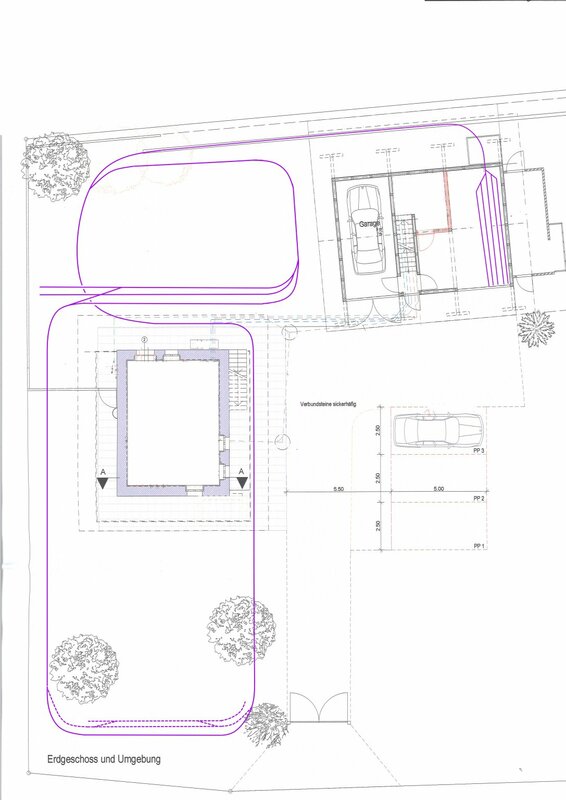 - I could get the car into the back garden / new garage then.. This is my 2% spirit level. It is one meter long, and raised 2 centimeters at one end. When it shows level, the grade is exactly 2%. The long straight substructure for the track (right) was built during the renovation work. In the garden a foundation for the track bed was created by the builders during the construction work. 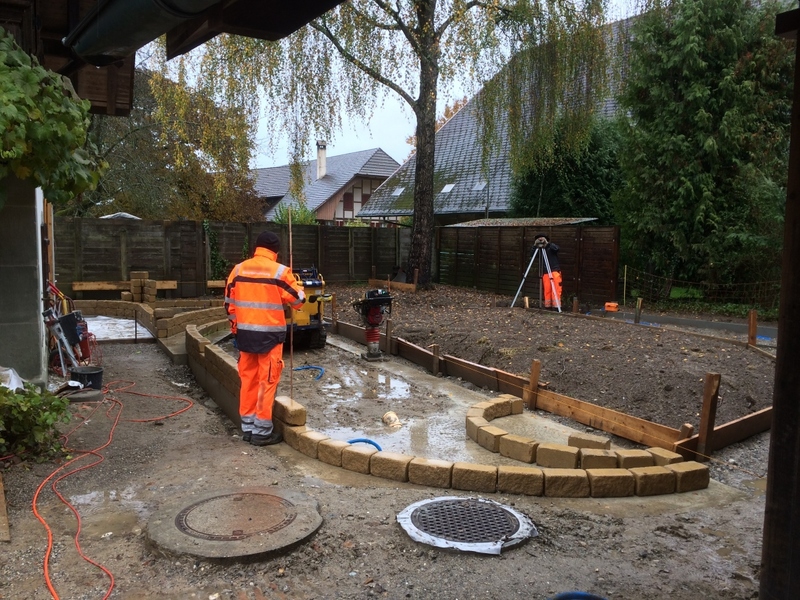 Case material was placed about 30cm down in the ground and compacted with a tamper. 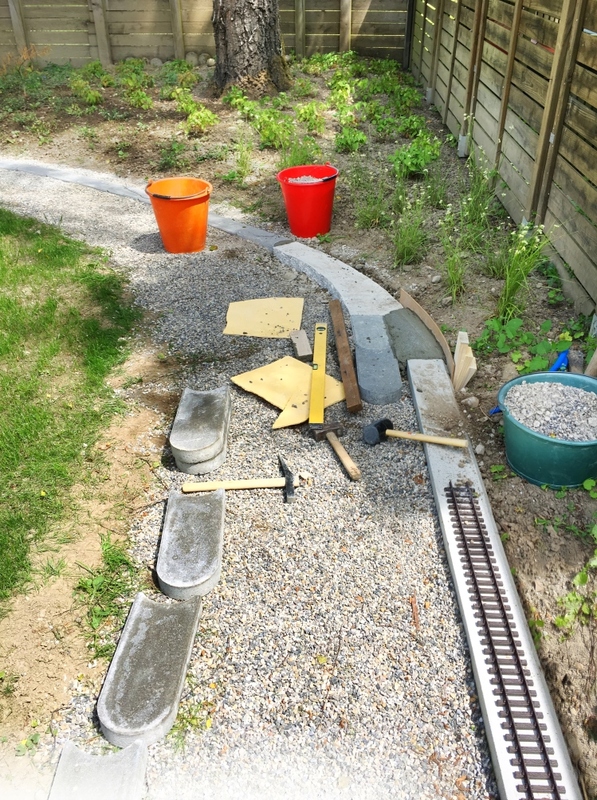 Then gravel was poured on top of that as a substructure for lawn edging stones. 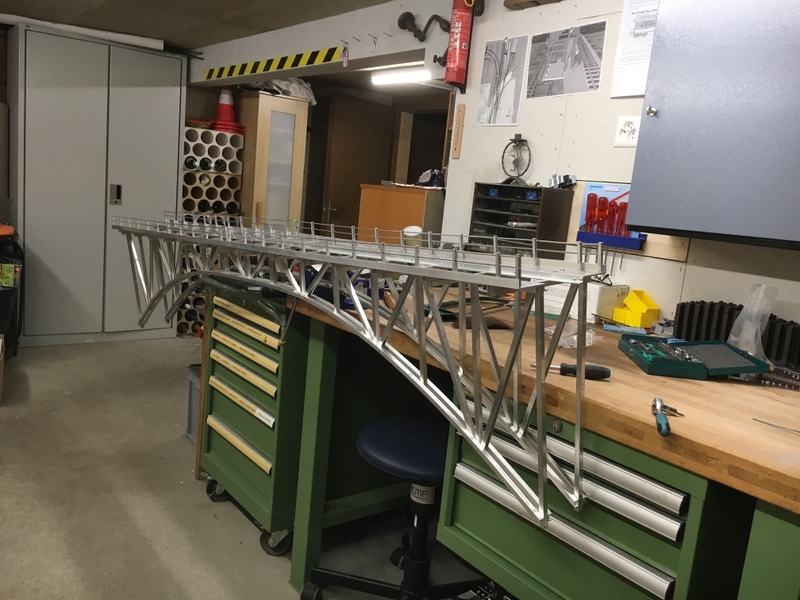 The tracks are made of stainless steel, and stay silver and shiny. 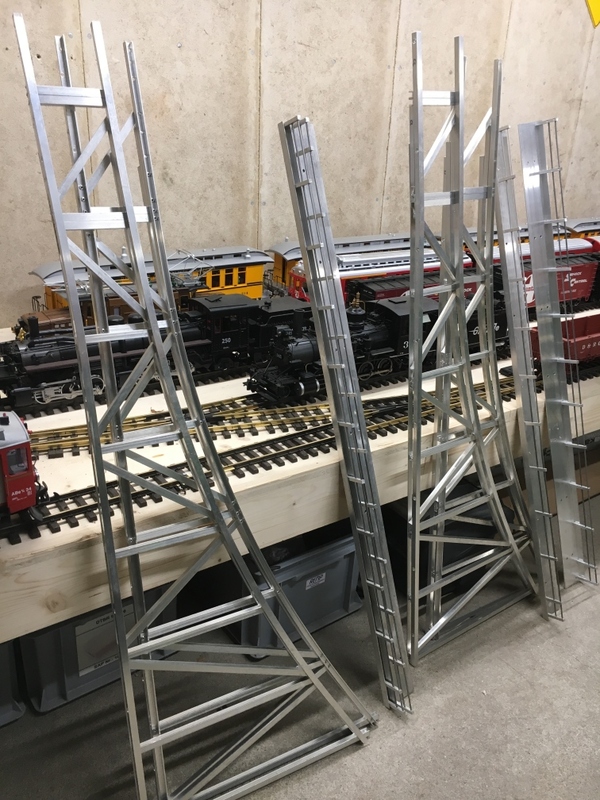 I cover the rail head with masking tape , treat the tracks with metal primer and spray them brown so they look pretty old. The curved switch is made by Thiel. 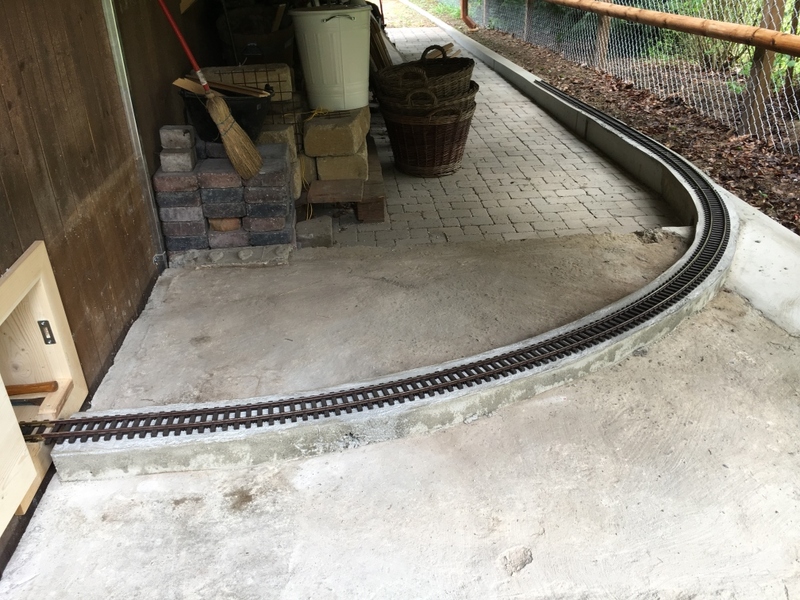 End of July 2017: Laying track on the raised plattform, with a little help from my friends. Next was the bridge over the cutting, where the track crosses over it's self in the center of the figure 8. The panels are sort of stone composite, used for roofing tiles and building siding. The trade name is "Eternit". They can be cut with a grinder. August 2017: The mail line runs through the station. And this is what it will look like when finished. 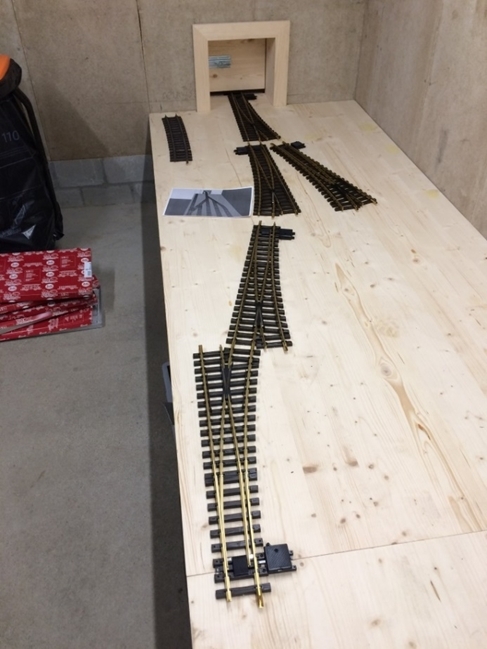 Very nice, only issue that I can see is the inability to get back into the Garage Storage Area quickly with your stock if it started to rain heavily or just to get things back indoors will all require the Loco to be moved to the other end of the Train. We call it a Run-Round in UK. A Ballon Loop round the Left Side Tree Erdeschoss if possible would facilitate that plus quickly giving you an option to have Trains Running in the opposite direction on Running Sessions. 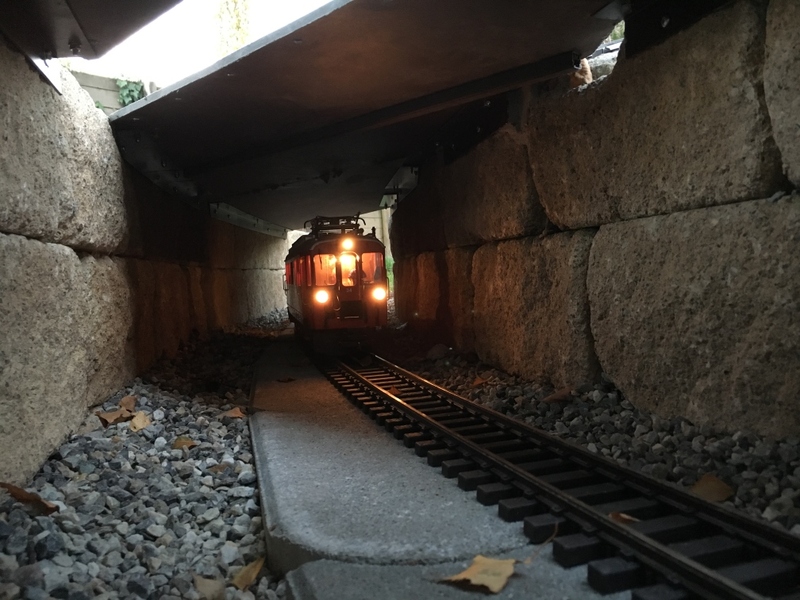 D&RGW, 1:20.3, well engineered & creative layout, some serious indoor storage, what's not to like ? And a a double slip, I likes a double slip. Moe please. What type of bridges are you going to have ? You have a damn fine railroad, and are one of my inspirations! I love all your pictures on facebook. I hope I get to your level of detail one day. I am not sure how I am going to get the railings looking just like this. With all the rivets, too! 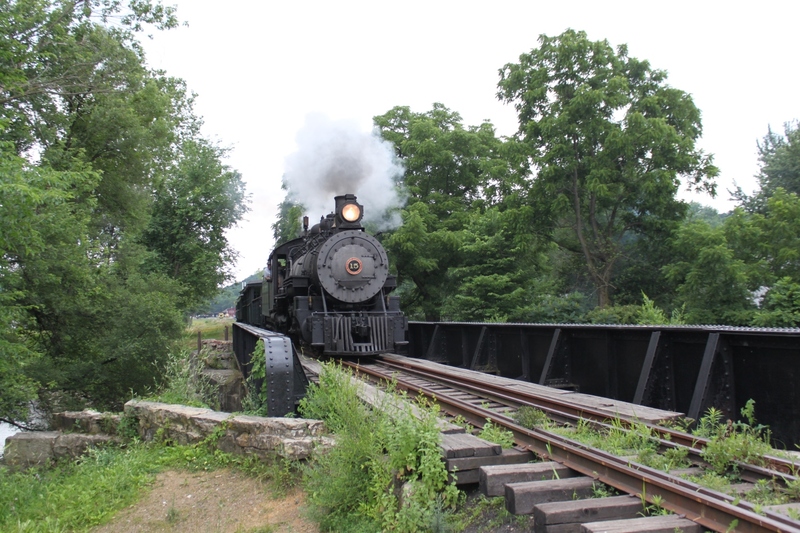 I took this picture on the East Broad Top Railroad, the last year they were operating. I know, it's not optimal. 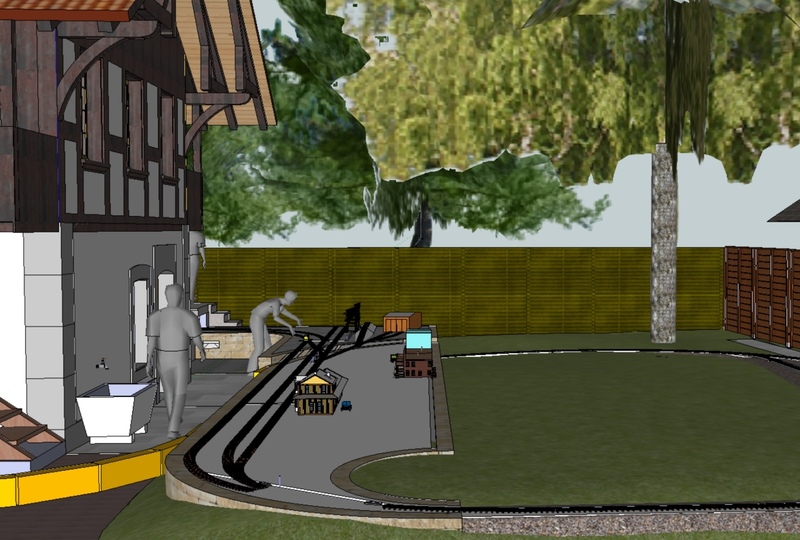 I am thinking about a loop somewhere on the layout, maybe a Why near the upper left corner of the garage. The line is actually a meter off the ground at the 'Erdgeschoss" tree. Pictures of this part will follow. I leave all the trains as they are, and don't do run-rounds. 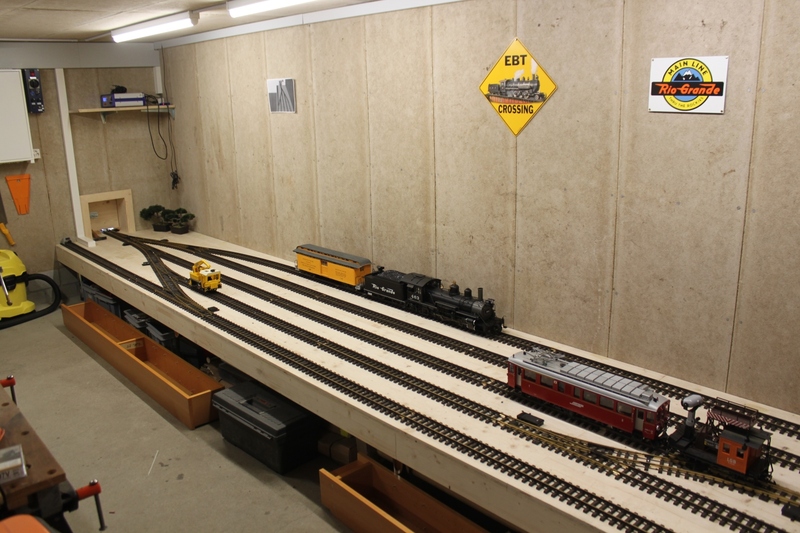 Some trains I have to back up into the garage, some trains I back down onto the layout. Nice! I will look into those bridge girders. Next installment in the building saga. 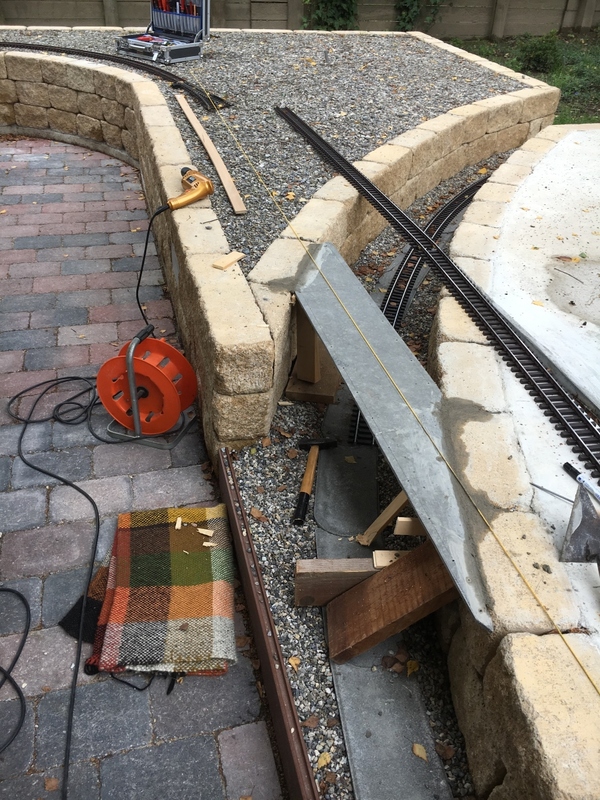 In the autumn of 2017, I got the bridges over the cutting done. 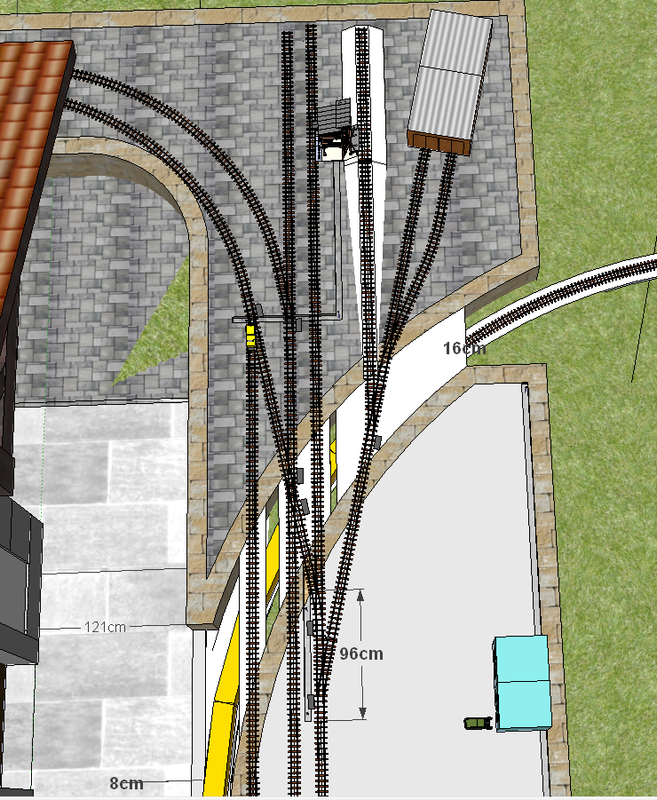 The spur in the top right corner will be the loco shed. It's an Otto Hopman bridge. Mr. Hopman from Germany makes them to order. He has lots of models to choose from. 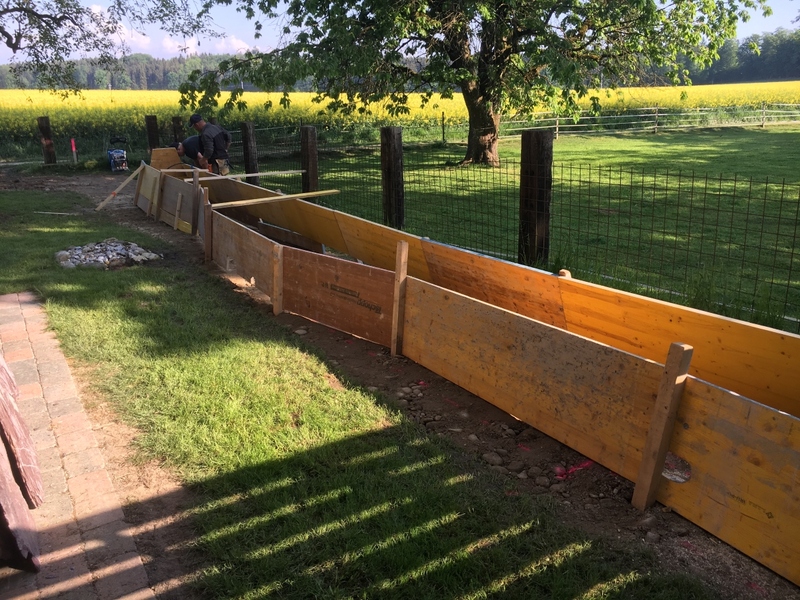 May 2018: Things started happening in the garden! 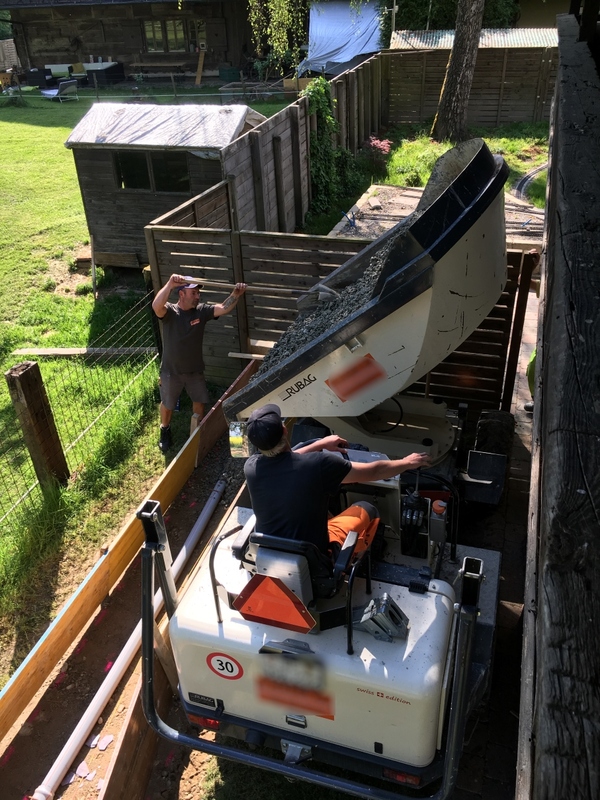 Two bewildered builders showed up, and had to be told by their boss that I was not crazy and that it would be no problem. Their boss is a fellow model railroader and now a friend of mine. He models HO in is garage. He understood what I was after and could upscale HO modeling to concrete, gravel and earth. He was invaluable throughout this project. 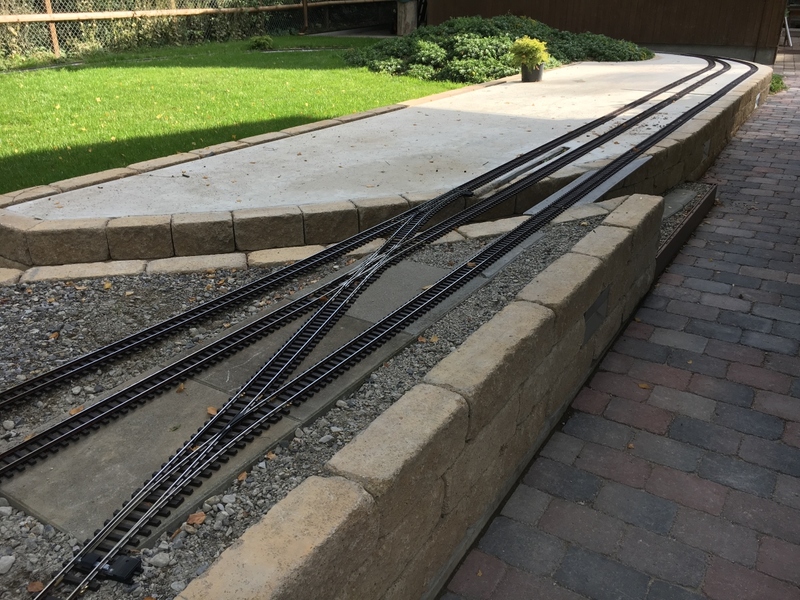 The builders set to work on the High Line, a raised strech of track about 15meters long. 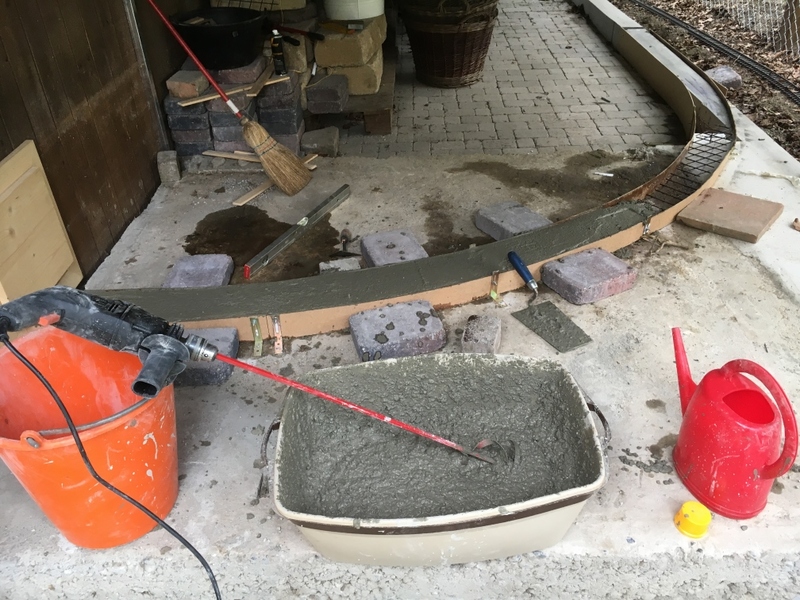 The core is made of lean concrete, lean because it has less cement in it and can be taken down with a mallet when I am dead and gone, and the next owners of the property want to get rid of the stuff in the garden. The sewer pipe is holding several electrical pipes. I found this special slate in a quarry in eastern Switzerland. The stone is Verrucano, and only showes up in very few places in the Alps, where the tectonic plates of Europe and Africa collide, and rock normally deep in the earth rose to the surface. 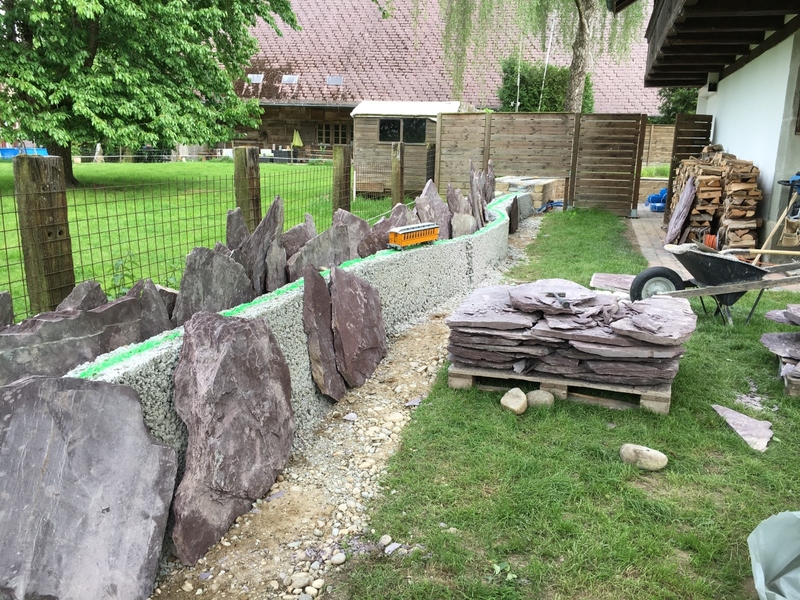 The builders started having fun and arranged the slabs of slate to resemble a mountain range. They got really in to it. Here the highline is still incomplete, first test with a passenger car. The green line will be where the track goes. Superb! Eagerly awaiting the next instalment.